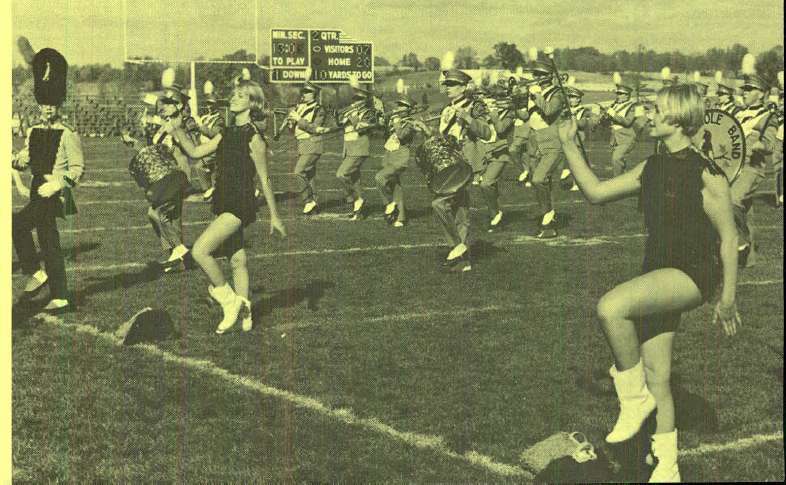 An announcement con­cerning the schedule of events for Home­coming 1968 was included in the June 1 issue of the Hillsdale Alumni Mag­azine. A col­orful halftime band will again be part of the big Home­coming Weekend at Hillsdale this year. Home­coming, 1968 at Hillsdale is scheduled for the most beau­tiful time of the year in the col­orful hills of Southern Michigan. It fea­tures a football game with one of Hillsdale’s greatest rivals in the modern era, Central Michigan. It will be held on October 11, 12 and 13. 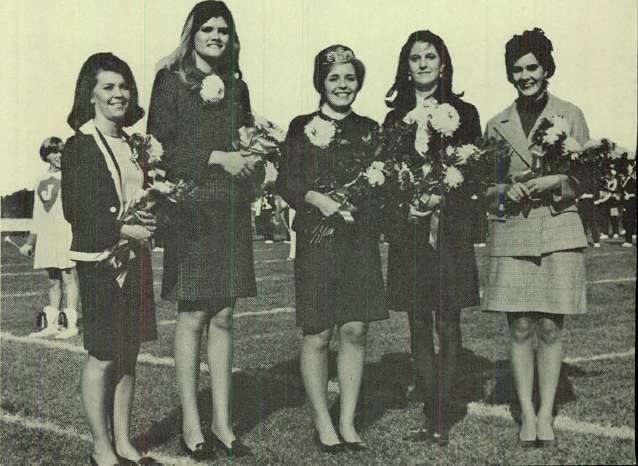 With so many things in its favor, Home­coming, 1968 is expected to attract one of the largest crowds of returning alumni in Hillsdale’s history for a big weekend of reunions, rem­i­nis­cence and good fel­lowship on the campus. It will give many alumni who have not been back on campus during the past few years a fine oppor­tunity to see the many physical advance­ments of the college. And to those who wonder about youth today, it will be a chance to renew their faith in the kind of an edu­cation Hillsdale pro­vides when they see the fine group of under­grad­uates now on campus. Ihe weekend will com­mence with the tall meeting of the Board of Trustees on Friday fol­lowed by the Trustee-Alumni Achievement Awards Dinner to honor several out­standing alumni now being selected by the Faculty-Alumni Com­mittee. On Sat­urday, reg­is­tration and a com­pli­mentary con­ti­nental breakfast will give alumni an oppor­tunity to get together in the lounge of the Dow Con­ference Center from 9:00 a.m. until noon. Lunch will be served in Curtiss Dining Hall and in the various Greek houses for returning guests. The football game will start at 2:30 and the pre-game band show by the Jackson High School band will start at 2:20. Tra­di­tional half time cer­e­monies will feature the crowning of the Home­coming Queen and fol­lowing the game there will be a coffee hour in the Women’s Gym. Another out­standing smor­gasbord hon­oring the Alumni Achievement Award winners will be held from 6:00 to 8:00 in Curtiss. An all alumni party will be held at the Stadium Rink on M-99 beginning at 8:30 and the Home­coming Ball will be a two band affair in Curtiss and the Knorr Student Center from 9:00 to 1:00. On Sunday breakfast will be served from 8:30 in Curtiss and in the Snack Bar. Alumni are invited to attend Hillsdale church ser­vices. An added attraction to many alumni will be the opening of the Michigan Inter­na­tional Speedway at Cam­bridge Junction on U.S. 12, Sunday, October 13. 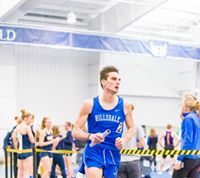 This two mile, high speed track is just 22 miles from Hillsdale and will open with a 250 mile National Cham­pi­onship race for Indi­anapolis type cars. A col­orful half time band show will again be part of the big Home­coming Weekend at Hillsdale this year. Months later, after home­coming had fin­ished, the Alumni Mag­azine ran a feature on the fes­tiv­ities. As forenoon blended into afternoon, the trek “down College Street” to Stock Field gained momentum. By gametime, over 6,000 fans had arrived for the Charger-Central Michigan football game and one of the college’s most mem­o­rable half time shows. With excellent support by the Jackson High School marching band, “Charge On!” made its debut as the new college fight song under the direction of its com­poser Jerry Bilik, widely-known arranger and orches­trator of numerous col­le­giate tunes. Carol (Scotty) English was crowned as Home­coming Queen by Student Fed­er­ation Pres­ident Bill Friedeman. Court members were Susan Barber, Linda Galley, Mary Lenning and Jane Partyka. Moments later, with a mag­nif­icent flourish, “Hillsdale” walked proudly to the 50 yard line. Hillsdale, the famed race­horse named in honor of Muddy Waters’ 1957 national small college champs and run­nerup “Horse of the Year” in 1959, was trans­ported to the campus from Lex­ington, Ken­tucky, at the expense of his owner, C. W. Smith of Bloom­field Hills, Michigan, to offi­cialy launch the new “Charger” ath­letic nickname. Proud and poised — and with an affinity for the queen’s bouquet of roses — “Hillsdale” drew an enthu­si­astic ovation from Home­coming spec­tators. Halftime recog­nition was given by Pres­ident Phillips to four alumni honored the pre­vious evening at the Trustee-Alumni Achievement Awards dinner. Alumni Achievement Awards were pre­sented to Dr. Charles R. Don­nelly, ’41, Pres­ident of Flint Com­munity Junior College; Capt. John W. Fair, USN, ’42, staff officer to the Com­mander in Chief, United States Atlantic Fleet; Edwyn H. Hames, ’43, founder and con­ductor of the South Bend Sym­phony Orchestra and retired chairman of the Hillsdale College music department and human­ities division; and Donald R. Mossey, ’51, mobile home man­u­fac­turing exec­utive. 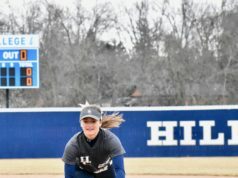 Also given special com­men­dation was Dr. Rose­crance, who marked his 23rd year as a Hillsdale College trustee and his 20th year as chairman of the board. Rounding out the busy day’s activ­ities was a postgame coffee hour, an espe­cially tasteful and col­orful Saga Foods smor­gasbord, showing of “No Kept Cit­izens”, the alumni gath­ering at the M-99 Roller Stadium and the Student Fed­er­ation Home­coming Ball in Knorr Student Center. At the latter event, winning Home­coming dec­o­ra­tions — based on the theme “Disney’s World” — were announced with Kappa Kappa Gamma and Delta Tau Delta selected for top honors. Much credit for the smooth-running success of Home­coming Weekend is attributed to student coor­di­nators Marty Millhon, Kris Place, John Warren, Jill Ross, Linda Eddy and Bill Friedeman; assistant alumni director Lillian Comar, and alumni asso­ci­ation pres­ident Roger Bisschop. It was a weekend of perfect fall weather; of countless reunions and new friend­ships; of an exciting flurry of events and activ­ities — it was Home­coming Weekend ’68, at Hillsdale College and one of its most enjoyable ever. Premier of the new college fight song, “Charge On” was played by the fine Jackson High School marching band and was directed by the com­poser, Jerry Bilik of Ann Arbor.